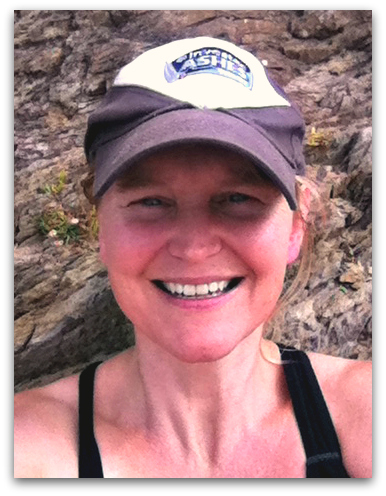 Editor’s note: Ingrid Kirkegaard is a writer and independent consultant specializing in education. The mother of two, she lives in North London and blogs at Dutch Courage. Try not to be intimidated by the fact that Ingrid studied French and Dutch literature at Cambridge University, graduating with a First, and then wrote her doctorate at Oxford University, among other academic accomplishments. Some weeks ago, Ingrid shared a few interesting tidbits on a Monday Post, and I asked her to expand on her ideas. Don’t miss the free template of Ingrid’s log that you can download and adapt to your own needs at the end of this post! “I will get up at 6:00 am and do one task towards my book.” This sounds like detention, but in fact it’s setting an intention. I am a writer. Here’s the record. There’s stuff I published as an academic. Then there’s an abandoned academic book; an abandoned novel; and now the attempt to finish another nonfiction book. I have been working on it for four and a half years. I can give all the usual reasons for my failure to complete — mortgage, children, day job(s), international relocation. They’re pretty big, and there’s no question they soak up my time — but they are not the real reasons I have struggled for so long with writing. Unfortunately for me, I am a perfectionist and a procrastinator. There is little to be proud of in these qualities. The public manifestation of them is that, unless there is a deadline, I cannot produce. The private hell is that I believe that what I produce is worthless. It’s like standing up in an Alcoholics Anonymous meeting, confessing that out loud. So I might as well go the whole hog. For me, there is a third dimension. The amount of sugar I consume is a direct index of my perfectionism and procrastination. I eat sugar, even though I know it’s bad for me, because I know it’s bad for me, when I do not know what to do next. Giving up sugar would mean… having to be honest with myself, facing the pain, and doing something about it. 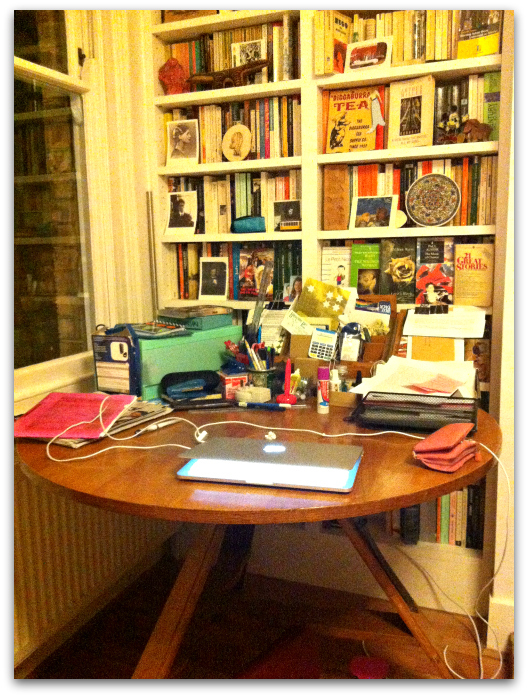 Work area #1: My desk belonged to my mother and father, and was one of the first items they bought when they got together in Holland in the 1960s. It doesn’t fit into our small house, but I cannot bear to part with it! But this feels impossible, so I have found another, kinder, way. Enter — The Sugar Log. When I went on holiday this summer, I decided to aim for three things: to go cold turkey on sugar for that week; to write for an hour early every morning; and to maintain a log. To my absolute amazement, I managed to do the writing and stay off the sugar — even though the family wafted ice cream and biscuits under my nose. Keeping that log really helped me. It had several columns: I set out a writing task; the date; what went well/what didn’t and why; next steps; writing notes; and a sugar confessional. When I’d finished writing for the day, I set the task for the next day. The idea of keeping a reflections log wasn’t new to me, but what made me try it for myself was seeing someone else’s. It was the amazing intimacy of reading another person’s very rough thoughts about her own work, all neatly compartmentalized in spreadsheet columns, that I found inspiring. I could see at a glance the way her thinking had progressed over time; it really helped me to see that she kept her daily goals very small; and it really, really helped me to see that her doubts and confusions were the same as mine — but contained. Since coming back from holiday, I’ve kept the log and the cold turkey going. I can see now that it’s possible to stay (mainly) off the sweet stuff, and not to panic, even if I can’t work for that crucial hour first thing. If I fall off the wagon and munch on chocolate, it is also not the end of the world. Because I can still set my intention and try again. 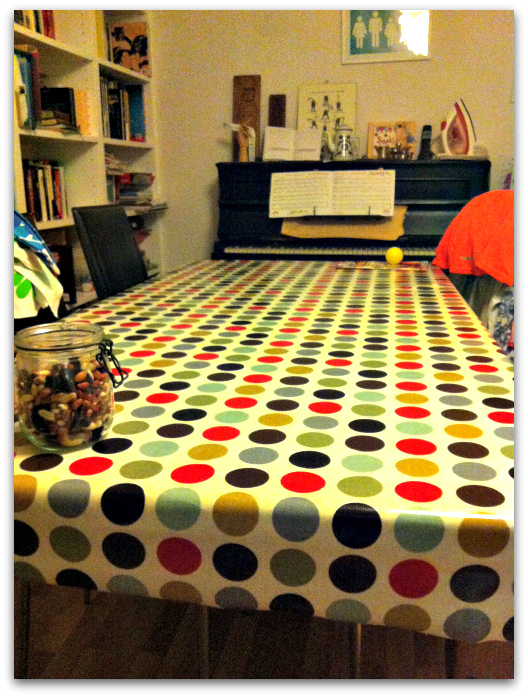 Work space #2: Our lovely dining table, with its very sensible oilcloth covering. I love that tablecloth! The log is different from my to do list and my online calendar, which sustain the grind of domestic life. The log is about my working process, and holding myself to account. And even taking a little pleasure in the process. I’ve noticed I am calmer, even though I’m hugely busy at the moment. Spelling out what’s going on defuses all the pressure. Keeping it to myself means I deal with that pressure without leaning on others. The log is like a daily postcard to myself — not too detailed, but a little bit of kindly attention being paid to my mental processes. This is a little turning point on the long road I’ve been on since becoming a mother and stopping being a professional academic. It is a road that has involved working to excess, falling into depression, learning how to dance, falling in love with yoga, and gradually, gradually understanding Marcel Proust’s crucial insight, that we are embodied creatures caught in time. What we get done is what we get done in time. Perfection has nothing to do with it. A screen shot of Ingrid’s Work Log appears below (click on the image for a more readable view). For a free Excel template of her log that you can adapt to your own preferences download this file: The Sugar Log. Many thanks, Ingrid! How about you? Do you find a connection between your consumption of sugar and your creative output? Share with us in the comments! So very interesting. I have never correlated the two, but reading this has made me wonder… I’ve been going through a lot the past few weeks; my sugar consumption has increased drastically while I my productivity level has been close to zero. I’ve enjoyed reading this. I think I’m ready to take control over both! This is not good for me! The lady whose Work Log I was inspired by had this to say in response to this post: “This makes me very happy! I have another tip. Use the thing you compulsively do before writing as a reward for writing, so, ‘When I have written for 15 minutes (important to set the goal low), I’m allowed to tidy/ check emails as a reward/ break’. Invariably you don’t get to the tidying. Still involves a certain amount of discipline but it seems to actually work! Oh Ingrid, Did you write this just for me? And how about that tablecloth? I am at the point in my work season where I have cleared my desks, said no to many things that do not serve my primary mission (to complete my book this year) and am just setting up how I will work. Your log offers me something I have craved….a little journal entry to reflect on what works and what doesn’t. I do many things too, have 2 teens in the house and one at college, I teach and run workshops and make visual art. It is all possible and pleasurable when I am disciplined. But last night, when stress mounted in a conversation I had with my college son about a very emotional issue, I reached for the chocolate and ate it- enjoyed it- but would have really enjoyed it sitting on the steps under the stars rather than tossing it down to my tight stomach. So glad to read you here. Miranda is a magnet for like-minded inspirations. Thank you Suzi — yes, I wrote it especially for you. It is as if that reaching for chocolate is the boundary no one else is helping us maintain, that sense of reassurance which no one is giving us when we do it, but which we then turn into a whip to beat ourselves with, knowing that it doesn’t do us any good. Same thought process in creativity all too often. I would love to be involved in your blog series! I’ll email you. And at the risk of over-commenting, my wonderful dance teacher reminded me that the other day that what led up to The Sugar Log was “learning to dance and learning to love to dance”. She is absolutely right. Even approaching the idea of ‘giving up sugar’ would never have been possible without the rekindling of creativity through learning to dance in my 40s…. I’m so thankful for this post (and for all the posts I’ve seen since subscribing to Studio Mothers). I’ve been moderately successful on fulfilling my goal of writing a blog post once per week – it’s been such a good feeling to follow through on that, and I’ve enjoyed feeling the bubbles of my juices flowing again!! I definitely use sugar as a “I’m frustrated,” “This didn’t work,” “The baby is teething – AGAIN” resort. I always end up feeling gross afterward and therefore less inclined to reattack whatever project I was working on (writing, baby, cleaning house…. ). 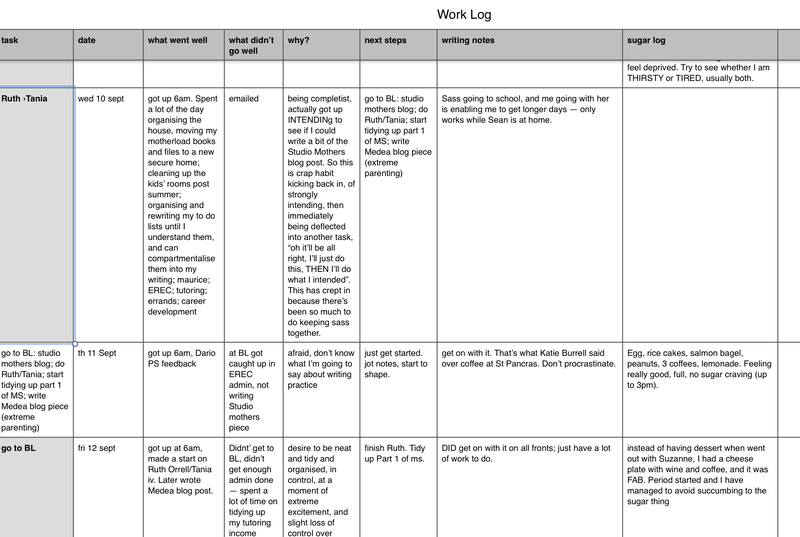 The log sound like a great way to examine habits and to see – IN WRITING! – your successes. Thanks for the great insight and for the lovely piece, too. I love your method, Ingrid! There is so much to be said for keeping a record; of anything, really. I have kept a separate notebook/calendar dedicated to only writing goals for a few months now, and it has helped immensely. Something about looking back over the days and seeing time, wordcounts, and goals achieved, is incredibly rewarding. Keep up the good work, and the good advice! This post is very inspiring. The part of setting an intention and small goals to give your creative work the importance it should have in the day to day is great! Thanks for posting!